The app store is a crowded universe. And while some apps take off like shooting stars, most burn out. The best way to fine-tune your mobile apps to shine for eons, is to make them undeniably useful — so personalized and relevant that they become a natural part of people’s lives. Discover how to measure and optimize your apps so they keep customers coming back for more. 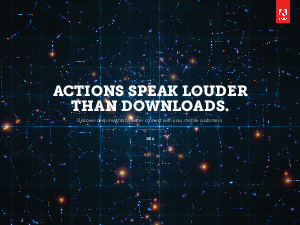 Read Actions Speak Louder Than Downloads.